The terrain in Maharashtra is highly uneven, and is primarily divided as coastal plains and eastern plateau. These are connected by ghats. Sixty such ghats exist in Sahyadri, and they have played a major role as commercial routes. Huge forts guarded each of them. The whole range that has been guarding the ancient commercial route of Naneghat for thousands of years includes the forts of Jeevdhan, Hadsar, and Mahishgad & Chavand. Jivdhan lies at the mouth of Naneghat, and is a quite tougher one. Moreover it is famous for the pinnacle Vandarlingi. The whole range of these forts originated during the rule of Satvaahan era. This is clear from the entrances carved out in stone. The fort stands at an important position and most important guard of Naneghat. From here any help to Naneghat could reach in less time. It was under Bahmani control and after that it went to Nizamshah. In 1636, Nizamshahi declined. Shahajiraje rescued Murtiza, the last Nizam from Jivdhan and took with him to the fort of Pemgiri. But he was trapped by Mughals and had to hand him over to them. This was the end of Nizamshahi. In 1818, the British captured all the forts here and destroyed them. 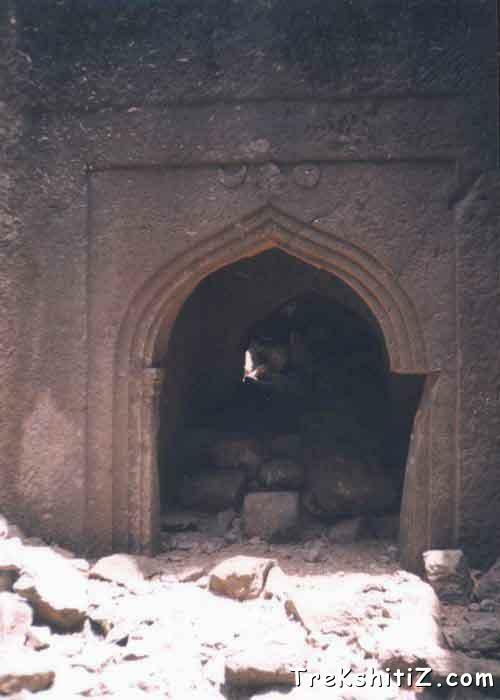 Jivdhan too became a victim and the main entrance was destroyed. Even today the marks of those wounds cannot go unnoticed as we climb the fort. This storehouse is quite huge and is the sole construction, which has remained so intact. It is highly decorative and height is about 4 meters. The pillars are carved out in rock and they are decorated by carving arts, which resemble open hood of a cobra. It is very huge and some of its openings have been closed. Its entrance is big, and much of its part is under the neighbouring hillock. Much of its part may be unexplored. There are a few cisterns, but those on the western side of the topmost hillock consist of potable water. These two are quite big. There are many dry ones, and we find some near the northern bastion. This is about 415 feet high. From its base it looks very awesome. Rock-climbers rate it as difficult to climb. It takes about 2 days to climb it. In the base there is a 15 feet deep cave where 4-5 people can stay. Here there some more pinnacles like Tok and Avlyachi Lingi. The way further the pinnacle is traverse to the main mountain and goes to the top. But the way is quite tedious and there are beehives. This bastion is in better condition and the ramparts here are intact. Here there are remnants of old houses and some cisterns. From here we can have a glimpse of Harishchandragad and pinnacles of Varhadache Navra-Navri to the northwest, Nimgiri and Hadsar to northeast and Chavand on east. From here a check can be kept on base villages and the whole plateau of Naneghat, along with the route to Junnar. This idol was initially on the southern part, but if we do not find it there, it is somewhere else on the fort. It should be seen whenever we go on the fort. Sometimes it may take time to locate it. It is a beautiful idol. It has four hands with weapons, which include a dagger of Muslim type, and a circular weapon. By its one hand the goddess holds the tongue of the animal on which it is standing. The goddess being fearsome represents the ancient and medieval ancestors who were continuously fighting for their freedom. This way has approach through the forests and a guide is much helpful. After we climb through dense forests and walk for about 2 hrs, we reach a diversion. On our right is the pinnacle and to the left is the main entrance. If we proceed rightwards, we come to the base of the pinnacle. Way further from here is difficult and there are beehives. We turn to the left from the diversion and reach the steps. These are broken due to the devastation by the British. The entrance being ruined, a small gap exists through which we reach the top of the fort. Here the bastions and ramparts are very intact in spite of such devastation. We reach the western side of the fort. From Ghatghar village, one way goes to Naneghat and the other goes to the fort. Its much better till one reaches the steps. Some of the steps have been destroyed and it has become slippery. From here we can reach the eastern part of the fort in 2 hours. One can stay on the fort in the Kothi, but mice may pose a problem. Trekkers also stay in the cave of Naneghat or the base village. The two cisterns on the western side of the hump are more reliable.